When the steaks are high, rump is a good-value choice! 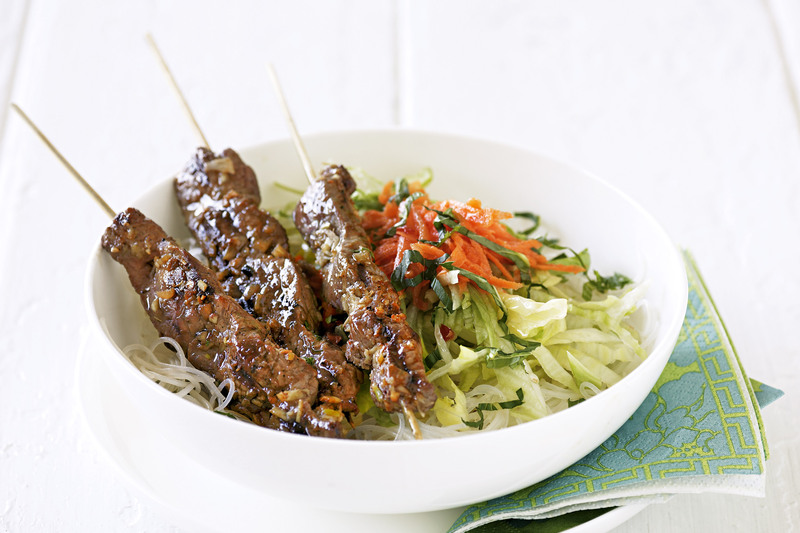 You’ll need 12 pre-soaked bamboo skewers. Process lemongrass, garlic, eschalot and fish sauce until a paste forms. Combine steak and lemongrass mixture in a bowl. Toss to coat. Thread steak onto skewers. Cook noodles in a saucepan of boiling water for 3 minutes or until tender. Drain. Rinse under cold water. Drain. Divide noodles between bowls. Top with lettuce, carrot and mint. Drizzle with sauce. Heat a lightly greased barbecue plate or chargrill on high heat. Cook skewers for 1 to 2 minutes each side for medium or until cooked to your liking. Add skewers to noodle mixture. Serve. Vietnamese dipping sauce is available in larger supermarkets. To make your own, combine 2 chopped long red chillies, 1 crushed garlic clove, 1 tablespoon brown sugar, 1/4 cup lime juice, 1/4 cup fish sauce and 1 tablespoon rice wine vinegar.Kim’s steak tips: Buy beef rump steak in bulk. Cut and divide steaks and place in snap-lock or freezer bags or wrap in plastic wrap and freeze for up to 6 months.Before cooking, drizzle or spray both sides of steak with oil and rub to coat. This stops steak from sticking and ensures there is no excess oil to burn or smoke.